FOXBORO, Mass. – If there was one play that summed up how Foxboro’s game against Hanover went, look no further than what turned out to be the game-winning bucket for the Indians. With Foxboro holding a 57-56 lead, the Warriors looked like they got the stop they needed. Hanover’s leading scorer JP Landry (25 points, seven rebounds) drove baseline and went up for his shot, only for Foxboro senior Teddy Maher to make a great play from behind to block the ball. 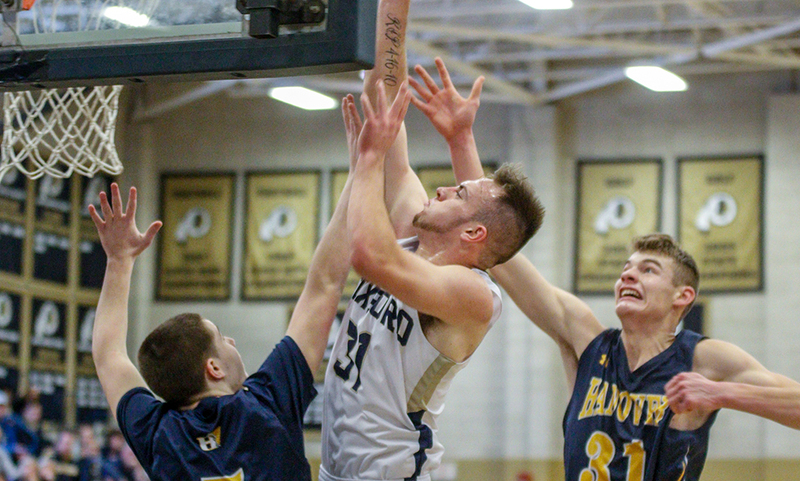 But the offensive rebound fell into the hands of Hanover’s Matt Delahunt – one of the Indian’s 15 offensive rebounds – and he quickly put it back up and in with a one-handed floater from the middle of the paint. That bucket — and those offensive rebounds — proved to be the difference as #5 Hanover edged #4 Foxboro, 58-57. Though that basket proved to be the difference, there was plenty of drama over the final 28 seconds. Foxboro had a chance to retake the lead, using the majority of the shot clock before senior Joe Morrison (13 points, four rebounds) found sophomore Brandon Borde (11 points, six rebounds) in the post. The sophomore made a nice move to create some space, turning into the paint and firing a turnaround jumper. The shot looked good, but was just inches off, hitting the back of the rim and staying out on the bounce. Foxboro immediately fouled, sending Hanover to the line with 4.3 seconds to go. Hanover missed the first shot, but once again, the Indians made their mark on the offensive glass, hauling in another offensive board. After another foul, Hanover once again missed the front of the bonus and Foxboro called timeout with 2.6 seconds left. But Foxboro’s last second effort fell short as the inbounds pass was tipped away at midcourt, securing the win for the Indians, the defending MIAA D3 State Champions. “Hanover is a terrific offensive rebounding team, we knew that coming in,” Gibbs said. Hanover had a 15-2 advantage on offensive rebounds and won the rebounding battle 38-24. “We certainly made rebounding a major point of emphasis but give credit to Hanover, they were relentless on the offensive boards. It just felt like all the biggest plays of the game were Hanover offensive rebounds. Foxboro had a strong start to the fourth quarter with a 6-0 spurt over the first two minutes. Borde converted a nice take to the rim, Matt Rongione (14 points) hit a three off of an assist from Devin Hassett, and Anthony Mollica hit one of his free throws to give the Warriors their largest lead, 54-45, with 5:48 to go. But the Indians refused to fold. The visitor’s battled back with Landry leading the way. He scored four points while the Indians added three from two separate trips from the free throw line to get within two. The Warriors snapped the run when Borde hit a free throw with 2:20 to go but Hanover came right back down and scored off the hands of Andrew Carroll off a nice feed from Landry to make it a one-point game. Rongione responded with a strong take to the basket, fighting through contact for two. That gave Foxboro a 57-54 lead with 93 seconds to play, but again the Indians had an answer when Landry hit a tough floater in the lane. Foxboro came up empty on its trip up the court, and it looked like Hanover did too. Delahunt saw his jumper hit off the side of the rim, and it looked like Foxboro had come down with the rebound. But a nice hustle play from Hanover resulted in a jump ball, giving the Indians possession back. That led to Delahunt’s floater after Maher’s block. Foxboro’s offense got off to a strong start, hitting four three’s in the opening quarter to create a 19-15 lead. Landry came up with a steal in the last second and hit a desperation three while falling to keep Hanover close. The offense continued to play well with 17 points in the second quarter. Senior Bobby Harrison emerged as a key part of the offense, scoring nine of his 11 points in the frame to put the Warriors up 36-31 lead at half. Hanover got within three early in the third quarter but Borde responded to push the lead back to five. When Delahunt hit to get the Indians within two, 43-41, Morrison came back the other way and converted to keep the lead. A three point play from Mollica late in the third kept the Warriors up, 48-45, heading into the fourth. Foxboro boys basketball finishes the season 19-5.